Destination Kohler is home to five- star accommodations and spa services, 12 world-class dining options, a host of outdoor activities and two championship golf courses in Whistling Straits and Blackwolf Run. An extraordinary combination of legendary design and visionary inspiration, Whistling Straits offers two distinct courses. Set atop the cliffs overlooking Wisconsin’s Lake Michigan is the rugged, windswept terrain that defines The Straits. Just inland, interspersed by four meandering streams, the grassland-and- dunes aspect of The Irish crafts a deceivingly tranquil landscape. Blackwolf Run offers two award-winning courses skillfully designed for golfers who appreciate the game’s great traditions. Both courses, The River and The Meadow Valleys, feature scores of pot bunkers and water areas shored with railroad ties. RESORT FACILITIES & INFORMATION: Accommodations: The American Club, Inn on Woodlake, and Sandhill. Restaurants: The Immigrant Restaurant and The Winery Bar, The Wisconsin Room, The Horse & Plow, Cucina and River Wildlife’s Lodge Restaurant. Amenities: Kohler Waters Spa, Demonstration Kitchen, Yoga on the Lake, canoeing/kayaking, horseback riding, sporting clays, walking and hiking. 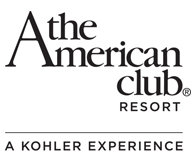 Group Director of Lodging – Kohler Co.: Christine Loose. General Manager – Destination Kohler: Michael Belot. GOLF FACILITIES: Whistling Straits: The Straits, par 72, 7,790 yards, Pete Dye. The Irish, par 72, 7,201 yards, Pete Dye. Blackwolf Run: The River, par 72, 7,404 yards, Pete Dye. The Meadow Valleys, par 72, 7,250 yards. PGA General Manager of Kohler Golf: Dirk Willis. PGA Director of Golf: Michael O’Reilly. PGA Director of Resort Retail: Josue Reyes. PGA Head Professionals: Michael Aschenbach (Whistling Straits); David Albrecht (Blackwolf Run). TOURNAMENTS HOSTED: 1995–1997 Andersen Consulting World Championships of Golf, 1998 U.S. Women’s Open, 2004 PGA Championship; 2005 Palmer Cup; 2007 U.S. Senior Open; 2010 PGA Championship, 2012 U.S. Women’s Open, 2015 PGA Championship, Will play host to the 2020 Ryder Cup. RANKINGS: #4 Whistling Straits – Straits, #15 Blackwolf Run – River, #45 Whistling Straits – Irish, #60 Blackwolf Run – Meadow Valleys, America’s Greatest Public Golf Courses, 2017–18, Golf Digest; Straits at Whistling Straits, #58, Golf Magazine Top 100 Courses in the World 2017. RATES: Golf Kohler packages start at $795 per person based on double occupancy, including two nights and three 18 hole rounds of golf per person. Package prices do not include taxes or resort fees.